Diabetes is a disease caused by elevated blood sugar levels. This condition wreaks havoc on the body and its systems (including the circulatory, immune, and nervous systems). Because of damaged body systems, issues in the lower limbs can quickly escalate into major medical emergencies. One of the ways to protect against problems is to wear the correct footwear. Wait, a second. Did we really just say that socks and shoes can be used to reduce the risk of serious medical problems? Yes, we did! 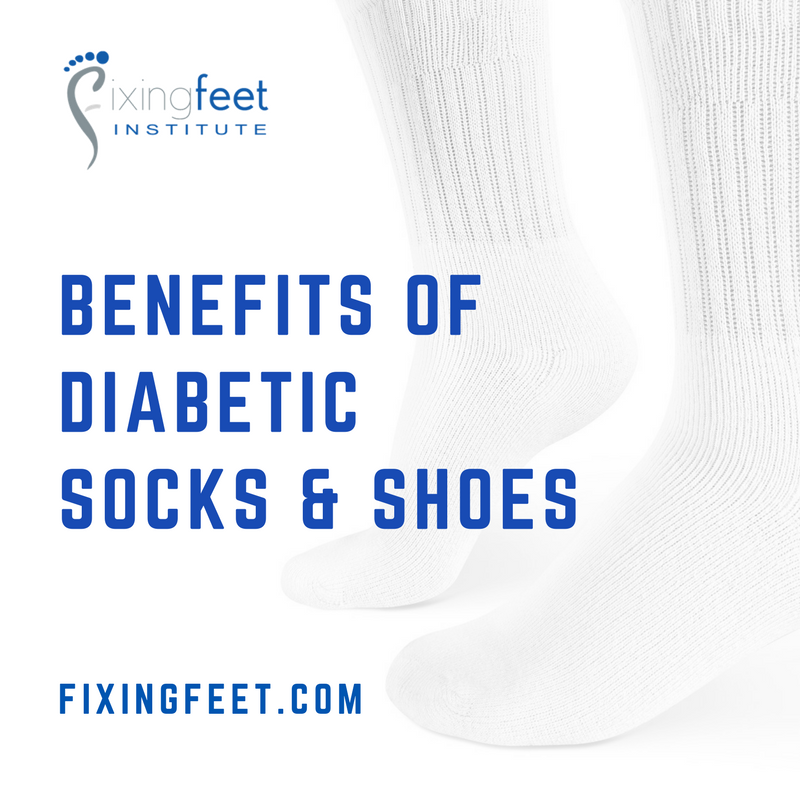 Before we jump into the benefits of diabetic socks and shoes, let’s take a really quick look at some of the problems that can develop in the lower limbs from diabetes. High blood sugar levels negatively affect the immune system, which your body relies upon to fight off infections and heal damaged tissues. Of course, the body also relies on the circulatory system to make sure body tissues are properly nourished. Unfortunately, diabetes causes blood vessels to become constricted, and this reduces the amount of nourishment delivered (especially to the feet – the farthest points on the body from the heart). The disease also damages nerves responsible for conveying sensory information to the brain. The systemic damage from diabetes can cause serious problems like Charcot foot and diabetic foot ulcers. One of the measures to reduce the risk of these conditions is to wear diabetic socks and shoes. So how do socks and shoes help? Reduce shock and shear. One way to keep diabetic feet safe is to reduce the amount of shock (vertical pressure) and shear (horizontal friction) experienced. Diabetic socks and shoes are designed to reduce these respective forces. Limit motion of joints. Controlling the range of motion for certain joints in the foot can help to decrease inflammation, relieve pain, and result in a more stable and functional foot. Relieve areas of excessive pressure. Too much pressure in concentrated areas can result in ulceration (skin breakdown). Diabetic footwear can redistribute forces in a more natural manner, thereby reducing the risk of issues developing. Accommodate, stabilize and support deformities. Many deformities need to be stabilized to both avoid further damage and relieve pain when diabetes is in the picture. We can help to protect the foot by making sure you have the shoes you need. Wearing the right kinds of socks and shoes is an important facet of diabetic foot care, but it’s certainly not the only one. You also need to perform a daily foot inspection and make sure you come and see us at the earliest opportunity whenever you find anything out of the ordinary. For more information on the diabetic foot care services we provide, or to request an appointment with our Surprise, AZ office, simply give us a call at (623) 584-5556 and one of our team members will be glad to assist you.